FILE PHOTO Brick-N-Motor has applied for a permit in the town of Henrietta. Owners Paul Vroman and Nathan Hurtt want to operate at an office park in the town. FILE PHOTO Paul Vroman makes tacos inside the Brick-N-Motor truck. 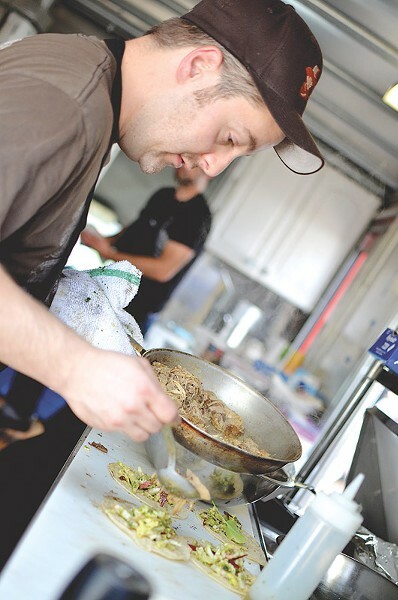 May 1 could be a watershed moment for local food trucks. That's when the Henrietta Town Board is scheduled to take up Brick-N-Motor's request for permission to operate a truck at the Eagle's Landing Business Park on Jefferson Road. The board postponed the request last month. "We took that as a small victory because it wasn't a 'no,'" says Paul Vroman, who co-owns the food truck with Nathan Hurtt. Brick-N-Motor had stopped at the office park two days a week for six months. They had the property owner's permission and employees welcomed the truck. But on March 15, Henrietta officials told Vroman and Hurtt they couldn't operate in the town without a permit. Hurtt drove to Town Hall and started the application process that day. But Brick-N-Motor's situation illustrates a broader issue. Rochester's food trucks are a burgeoning business, and local laws haven't necessarily caught up. 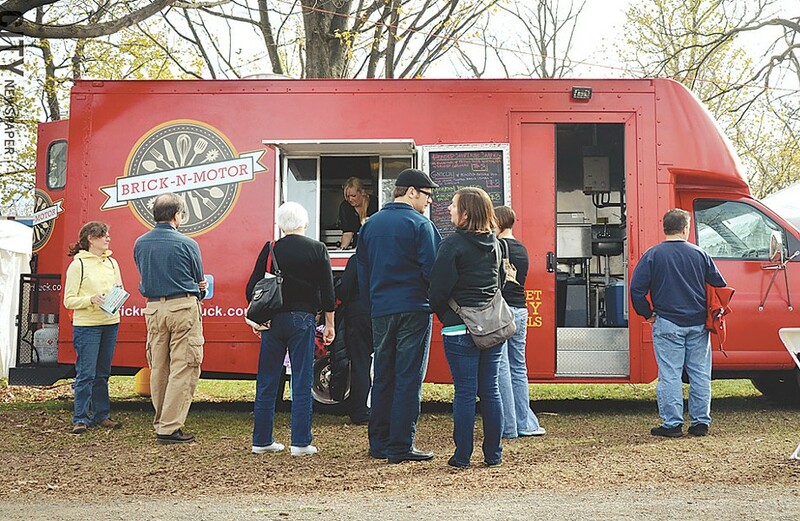 Before Henrietta, the food truck debate hadn't played out publicly in any of the suburbs. Each town and village has its own laws and requirements that could apply to the trucks. And as the businesses expand their range, operators and officials will undoubtedly have questions about where the trucks can operate legally and profitably. "It's a learning process for everyone, and I think that the best thing we can do is work together," Vroman says. That's what's happening in the City of Rochester, which has been the center of the local food truck scene. Over the past year or two especially, there's been much debate between truck owners, customers, and city officials about where the trucks can and should operate. But cooperation between truck operators and city officials is bearing some fruit. The city will start a downtown pilot program for food trucks in June. Several predetermined spots will be set aside for the trucks. Henrietta officials have opposed permit requests from mobile food vendors in the past. Generally, the requests have been to operate carts, not trucks. Town Board member Bill Mulligan says the argument against the mobile vendors is that they are unfair competition to the town's 150 or so restaurants, and that they don't pay property taxes, own buildings, or need to hire employees. And on some occasions, cart operators have asked for permission to set up close to other restaurants, he says. But Mulligan is ready to support Brick-N-Motor's request. He says the truck is performing a service to the people at Eagle's Landing, who have no food options within the park — unless vending machines count. And there are few dining options in the immediate vicinity, Mulligan says. "This is a guy trying to get started, and hopefully if he does well, at some point down the road he will build a building or buy a building and operate a full-scale restaurant," Mulligan says. "I'm very upbeat about it. I think it has some merit." Town Board member Jack Moore says he also wants to find a way to allow the trucks, as long as they're not directly competing with the town's restaurants. "To me, it's a very new, creative way of serving the public," Moore says. Brick-N-Motor isn't the only food truck making suburban stops. Trucks have been operating in Perinton, Pittsford, Brighton, and other trucks even make occasional stops in Henrietta. There are business opportunities in the 'burbs, including isolated office parks, says Lizzie Clapp, co-owner of the Le Petit Poutine food truck and co-founder of the Rochester Food Truck Alliance. But Clapp says she and other alliance leaders encourage food trucks to operate only where they're permitted. Le Petit Poutine generally operates in the city. In some of the suburbs, the trucks are regulated under the same statutes as food carts. For about 10 years, the Village of Pittsford has allowed a hot dog cart to operate on a town-owned spot along North Main Street. But Mayor Bob Corby says that's one of only a few places a cart would be allowed. The village won't let carts within the central business district or along Schoen Place, he says, because they'd eat into already limited parking and they'd compete with restaurants. Food trucks would be harder to accommodate, Corby says. They're bigger, can serve more people, and can generate noise. Corby says that about 10 years ago, the village received an application for a food truck, but there were too many obstacles and the request was denied. The Gates Town Board is considering a permit request to operate a food cart at Off-Track Betting on Marway Circle. A public hearing is set for May 6. Gates has a few requirements for applicants seeking a vendor permit, says Supervisor Mark Assini. Applicants have to prove that the property owner has given permission to operate on the site. They also must have set operating hours and health department permits. And the town will determine the safest spot on the property for the vendor to locate, Assini says. The Town of Penfield has similar requirements, though officials there leave it up to the applicant to propose a spot on the chosen site. The town's Zoning Board reviews the application and decides whether to license a vendor, says Jim Costello, the town's director of developmental services. Among the criteria it considers: whether the proposed location interferes with traffic or pedestrian circulation, and whether it interferes with emergency access. "We just haven't had anybody knocking on our door for them at this point in time," Costello says.